One of the strengths of The History Harvest is our practice of making a digital replica of an item or oral history, so contributors do not have to sacrifice possession of their artifacts. This practice is also advantageous in terms of accessibility, as digital items can be duplicated and viewed and used simultaneously by individuals across the world. Open access is also an essential component to the History Harvest’s goals, which include representing the historical experiences of the people of the nation. In this spirit, we cannot lock up these items in elite institutions, but rather strive for access to individuals outside of academe and of all socioeconomic backgrounds. This is especially important in regards to our two most recent events, where we worked with people whose histories are often hidden or invisible, or whose cultural artifacts have been stolen, decontextualized, or manipulated in the past. It can be very difficult to strike a balance between free and open use and the protection of one’s very personal family and cultural history can be a difficult. Contributors provide all ownership of digital copies to The History Harvest, so it is our duty to try to find a balance that best serves our purposes and those of our generous contributors. With this in mind, we have given a Creative Commons CC-BY-NC-SA, meaning that the materials are free to share and remix, on the condition that attribution is given, the items are not used for commercial purposes, and derivative works are distributed with the same open license. Although we can give items more restrictive licenses when needed, the Creative Commons license ensures that the materials can be freely utilized for further scholarly inquiry and collections. At the same time, the Noncommercial and Share Alike conditions prevent others from taking advantage of these materials and placing important histories behind paywalls or otherwise profiting from them. The members of the communities we have worked with have provided a great service to our archive and our students, and we must make a concerted effort to give back to these individuals and organizations. It is important that members of the community have access to these histories, and are aware of the archive’s existence. The archive is open and free online, built upon the open source Omeka platform, and is deliberately designed to be simple and easy to use. However, open licenses and simple UI can only take the access so far; we must take steps to bridge the digital divide in these communities with socioeconomic and language barriers. Next week, History Harvest students will be going back to the Lincoln, NE refugee community for a brief presentation and discussion with some of the participants. We have also had some great local press, and hope for continued media coverage in the future. I hope to develop a relationship with local public libraries and community centers to try to close the digital divide as best we can, and ensure that people in these communities have access to their histories. Brandon Locke is a graduate student at the University of Nebraska-Lincoln. He is Project Manager of The History Harvest, and has assisted with the North Omaha and Lincoln Refugee History Harvests. How do we digitize, curate, and manage community history? As important a question as this is, encompassing technology, stability, pedagogy, institutional priorities, and numerous other considerations, it leads to questions that may be even more important in the context of interacting with community participants – How do we talk about the ways we are digitizing, curating, and managing community history? What does a digital record mean for individuals without access to, or familiarity with, technology? Students preparing for a History Harvest event must be ready to explain the processes taking place to participants who may live well on the other side of a digital divide. From the earliest planning stages of HH, we expected to encounter this divide and those of us doing interviews brainstormed ways to explain the techniques and technology of digitization without jargon or condescension. The importance of this preparation became clear during from the beginning of the program, as many of the individuals we had the opportunity to interact with at the first two HH events either had no computer or used computers primarily for email – the idea that we would be “digitizing” their object/their stories encapsulated a number of processes with which they had little to no familiarity. In these interviews, it was as important to be able to explain what we were doing with their history and where it would “live” as it was to capture an image or a video. It became clear in these interviews that participants would most likely never access their own digital record – they planned to tell family and community members, but were not planning to change their own relationships with technology as a result of the event. Community participants’ willingness to share their stories, their objects, and their images in digital formats they themselves will likely not access is, for me, an important marker of the History Harvest. The desire to preserve and share individual and community histories in one of the most visible modern spaces, the internet, has moved people to participate in the History Harvest in spite of, not because of, the place of technology in their lives. Whether they are contributing to an event in this format because HH is the first time their individual histories have been taken into consideration, or if they are doing it with an eye to the future and preservation, they are sharing pieces of their lives with strangers wielding unfamiliar tools. When those of us whose professional and personal lives are firmly embedded in technology talk about honoring and respecting community participants who are sharing their history, we also need to remember they are trusting us with its future in ways they may not understand, but they do value. Leslie C. Working is a PhD Candidate at the University of Nebraska-Lincoln. She has been a part of the project since the start, and has helped with the Railroads and Nebraska City History Harvests. I am a non-traditional undergraduate at UNL with a major in History and two minors in Ethnic Studies & Communication Studies. As a junior, I was one of the original eight (8) advanced undergraduate History majors who enrolled in the History Harvest class in the fall of 2011, which focused on African American history in North Omaha. I enjoyed the eye opening experience tremendously, so decided to enroll again for the fall 2012 History Harvest, which focused on the Lincoln refugee community. In both History Harvest classes, students worked as a team, along with Dr. Jones and members of the local community, to organize, promote and execute the History Harvest. We also conducted oral history interviews with community members and processed materials for the web-archive. I saw this opportunity as a critical part of my ongoing development as a History major. One of the reasons I wanted to be involved with this class was because it gave me that more hands-on experience doing history that I needed. In turn, this direct involvement with historical work led me to new insights and a new depth in my evolving understanding of history and how you do it. These projects provided me the experience of working directly with artifacts, conducting original interviews, and, overall, allowed me to better understand race relations and the experience of African Americans in Nebraska. Each History Harvest class reaffirmed for me that our shared history is all around us, but is often hidden, or badly in need of collection and preservation. My involvement also brought home to me the power of history to alter the way we see and understand our world, and in the process, better understand the diverse experiences of different people. Overall, the History Harvest has helped me sharpen my professional goals as a historian and archivist and has made me all the more excited to continue down that path. I have seen the transformative power of this project and this history in both classes. We saw first-hand the way the projects brought young historians together in a unique alliance between disparate groups, like UNL, the Great Plains Black History Museum, the Malcolm X Memorial Foundation and Birthsite, Love’s Jazz and Arts Center, The Center for People in Need, Division of Children and Family Services, Author, Mary Pipher, Nebraska Department of Health and Human Services, Good Neighbor Community Center, African Multicultural Center, Nebraska Entertainment Television and others. I have been told countless times by community members how important this work is and how excited they are about the project. I was able to understand the way that history can be a part of the broader revitalization plans in North Omaha and how it might play a role in helping the established community in Lincoln, Nebraska, better understand the histories and cultures of new refugees. And I think the History Harvest provides a great example of the way innovative new teaching approaches can help build bridges between what we do on campus and what is happening in communities across our state, and nation. In this way, my participation in the History Harvest project gave me a new appreciation for the power of history to connect people and develop community. In addition, despite being an African American man in my late-40s, the North Omaha History Harvest was my first significant encounter with African American history in a direct, hands-on manner, and it made quite an impact on me. As a military kid and later a serviceman myself, I moved around a lot growing up and into adulthood. I never lived in a black community and my experience in the military did not reflect the complexities of race in civilian life. Helping to capture, preserve and share this important local African American history was tremendously empowering and stirring. Not only did this history fill in important silences in my mind, but also helped me better make sense of my own experience and my place in the broader society. It cast traditional narratives of American history in a crucial new light by bringing black voices into the mix. In the end, my experience in the History Harvest clarified my continuing interest in history, material culture and African American experience. Recently I was accepted to graduate school to continue this journey! Robert Perry was an undergraduate student in the North Omaha (Fall 2011) and Lincoln Refugee (Fall 2012) History Harvest courses at the University of Nebraska-Lincoln. Join us for History Harvest Blitz Week! 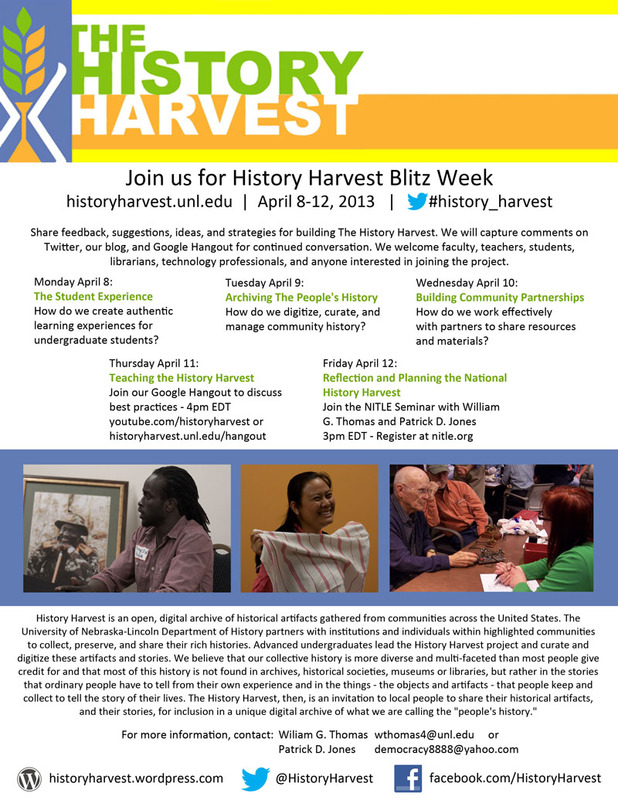 Join us for History Harvest Blitz Week April 8-12, 2013.Share feedback, suggestions, ideas, and strategies for building The History Harvest. We welcome faculty, teachers, students, librarians, technology professionals, and anyone interested in joining the project. How do we create authentic learning experiences for undergraduate students? How do we digitize, curate, and manage community history? How do we work effectively with partners to share resources and materials? Posted in Uncategorized	| Comments Off on Join us for History Harvest Blitz Week! About the History Harvest: An innovative new authentic learning initiative. The History Harvest is an innovative new authentic learning initiative in the Department of History at the University of Nebraska-Lincoln. This collaborative, team-oriented, student-centered and community-based project seeks to create a popular movement to democratize and open American history by utilizing digital technologies to share the experiences and artifacts of everyday people and local historical institutions. At each “harvest,” community-members are invited to bring and share their letters, photographs, objects and stories, and participate in a conversation about the significance and meaning of their materials. Each artifact is digitally captured and then shared in this free web-based archive for general educational use and study. Overall, the History Harvest project aims to raise visibility and public conversation about history and its meaning, as well as provide a new foundation of publicly available material for historical study, K-12 instruction, and life-long learning. It is the collaborative, community-based approach to history, and the shared experience of giving, that is at the heart of the History Harvest concept. The project makes invisible histories and materials more visible by working with and within local communities to collect, preserve and share previously unknown or under-appreciated artifacts and stories. Initial “harvests” are taking place in a series of communities across the Great Plains region, but ultimately we hope others nationwide will join this movement by hosting “harvests” in their areas and contributing the artifacts they collect to this expanding national web-archive. The artifact-based approach to this project elevates family and local histories by making them more available and, in the process, challenges the supremacy of traditional elite sources by dramatically expanding the pool of historical artifacts easily accessible to students, scholars and everyday people seeking to learn more about our collective past. The harvesting of local artifacts will reveal important new historical materials that are currently buried in attics, basements and archives. Both individuals and institutions can participate in this effort. For instance, a museum may wish to offer rarely seen items from its collection, or ones that attract the most attention locally; a community historical society might share a sampling of its holdings for digitization; or, an individual or family may bring their letters, photos or other interesting historical objects. The History Harvest also provides students a unique and often transformative hands-on experience with historical work. Students, with the guidance of a faculty member, work as a team to plan, organize and promote each harvest and then process and analyze the artifacts and oral history interviews they collect. As a digital initiative, the project takes advantage of innovative new technologies to engage students in building history, reflecting on historical change, collaborating to create interpretive accounts of the materials they collect and sharing what they find with others. The History Harvest project, then, is designed explicitly to develop the online space for history and to support a new pedagogical model of teaching and learning that allows undergraduates to create and participate in a “community of scholars.” With the opportunity for other institutions to participate and federate with us, we envision the project as experiential, collaborative, authentic, scalable, embedded with new knowledge creation, public-spirited, locally oriented, and flexible. We are excited for what the History Harvest movement could mean for the way the American past is collected, preserved and shared. Join us! Posted in Uncategorized	| Comments Off on About the History Harvest: An innovative new authentic learning initiative.